Solar energy installations, both residential and commercial, are becoming increasingly common across Australia and it’s because it’s easy and financially viable now. Ask yourself why you haven’t got one and unless your reason is because you rent or don’t have a roof then you probably don’t have a valid reason anymore to not be taking the plunge on solar. 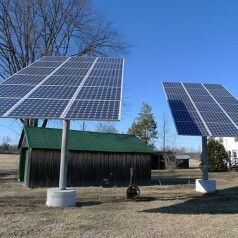 Property owners will find solar energy to be a better investment than ever before. Right now in Australia the cost of installing solar panels sufficient to completely negating the usage of the average household is under $10,000. With average quarterly bills in excess of $500 and rising, this means that in around 5 years your investment will have paid for itself. Not bad when you also consider the environmental benefits of doing so. That’s not even taking into consideration the fact that meteorologists predict that La Nina has finally waved bye and as such the sun will be shining extreme for the next time period. If you practice reducing your energy consumption, not only will you pay for your solar system in double time, but you will also get reverse credits on your bill. This means that you can actually make a little extra money just for decorating your roof with some snazzy silver solar panels. Perhaps the best personal benefit to going solar for the average Australian, is removing yourself from the fossil fuel fed energy grid, a situation that is shaping up very grim. With coal and oil prices always climbing and the federal government carbon trading scheme in full swing, energy companies are desperate to pass on overheads to the consumer, and so the retail price of energy climbs too. It’s kind of bizarre just how long it has taken the country and indeed the world to get behind full home solar installations. Solar hot water systems have been a popular way to bring down your electricity bill for nearly two decades and the technology has been around for a very long time. We hope that it’s not a case of closing the gate after the horse has bolted. Really though, the government pays for most of it, it pays the rest itself, eventually it pays you and gives you the warm feeling inside that you are doing right by the planet. I know now that for everyone in Brisbane solar panels are right at the top of their shopping list and they should at the top of yours as well. If you need more convincing get in touch with CB Solar, Brisbane solar panel experts.